Listen to this (Dinah Washington- This Bitter Earth as she sang it in 1960 )for thirty seconds or so. Now listen to a few bars of Max Richter’s “On the Nature of Daylight”. Now hear how Max Richter combined them. I think you will listen all the way to the end. 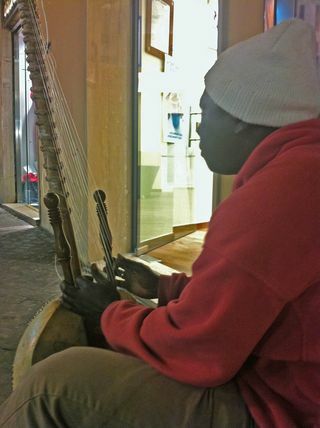 I met a guy playing the kora on the street last night. It is such a beautiful instrument to look at and to listen to. Here’s a description. Other griot names, I found out on this page are Kouyate, Traore, Susso/Suso and Tounkara. It always makes me happy to see and hear a kora, so I thought that I would share my favourite kora song from my favourite kora album, entitled Kairaba Jabi with Dembo Konte and Kausu Kuyateh. I could listen to their conversations, because that is what it sounds like, for hours. It’s also the kind of music that makes you want to set out on a 10,000 mile journey. Here is a step-by-step depiction of John Coltrane’s amazing playing on “Giant Steps” as he relentlessly races through chord and key changes. If you watch carefully you’ll feel that you are the one playing. I found this on a Youtube channel http://www.youtube.com/user/dancohen?feature=watch which also has an animated transcription of Miles Davis’s “So What” and two or three Charlie Parker pieces. If you are interested in finding out more about the musical theory involved in the changes Coltrane played you can read this article. Just to remind myself that there are at least two ways of doing things, here are a couple of clips I came across some time ago, both of outstanding performances. The first one is Arturo Benedetti Michelangeli playing Domenico Scarlatti’s Sonata in B Minor K 27 in 1949. What this feels like to me is approaching a crystal lying at the centre of the universe. Everything is under complete control: the piano, his hands, his face, his feet, the turn-ups on his trousers and every single hair on his head. It is so perfect that if any flaw had developed anywhere in the crystal, if someone for example were to have crept in and untied one of his shoe-laces, perhaps everything would have shattered, leaving a pile of tiny splinters and his moustache.